James Bond is a fictional English spy created in 1953 by writer Ian Fleming. The character is the subject of one of the longest film series in history. Futurama has referenced it a few times. 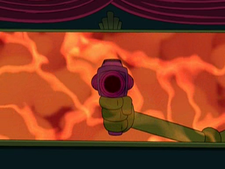 In "A Head in the Polls", Bender uses Bond's catchphrase "shaken, not stirred". In "Raging Bender", the crew goes see a film the opening of which is a parody of the openings of James Bond films. In "Kif Gets Knocked Up a Notch", the Planet Express ship boards the Nimbus in a way reminiscent of the James Bond film You Only Live Twice. In "Three Hundred Big Boys", Zoidberg goes to a store called Diamonds Are Forever, the name of a James Bond novel and film. In "Murder on the Planet Express", Fry goes to a store called For Your Eyes Mainly, a play on "For Your Eyes Only" — the name of a James Bond short-story collection and a James Bond film. In the commentary for "Kif Gets Knocked Up a Notch", Maurice LaMarche tells David X. Cohen "never try and stump me on the James Bond stuff, man". This page was last edited on 31 December 2014, at 19:38.